It is possible we could receive our first official snow of the autumn season. The National Weather Service in Paducah have issued a winter weather advisory for Wayne, Jefferson and Edwards Counties. The advisory will be in effect from 6-10 p.m. A 70% chance of precipitation of rain early, followed by snow showers is likely. New snow accumulation of less than a half inch is possible.A winter weather advisory for snow means periods of snow will cause primarily travel difficulties. Expect snow covered roads and limited visibilities, and use caution while driving. Citizens are to be aware that surfaces could possibly be slick. The snow should depart by Saturday. Area police are searching for two southern Illinois residents. 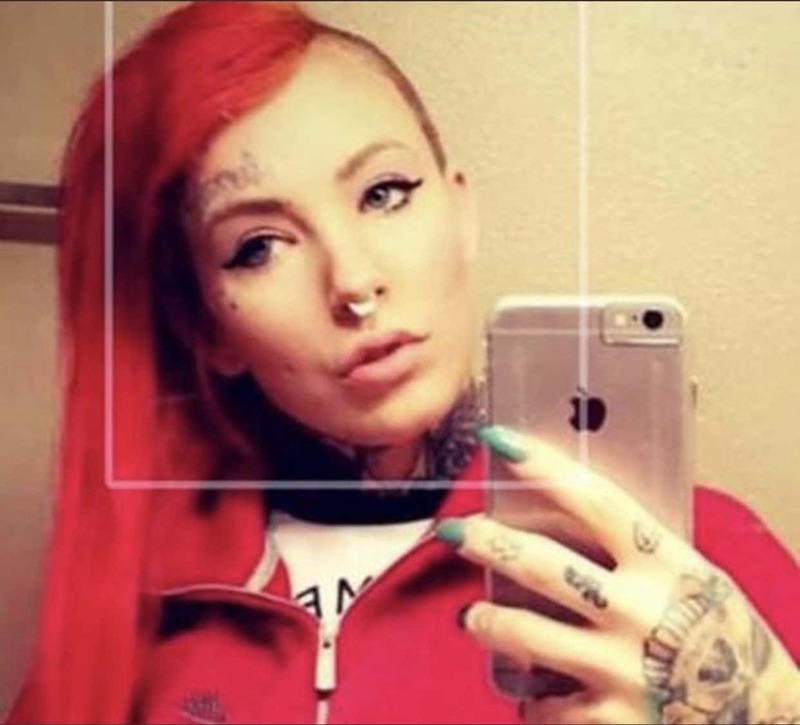 28-year-old Lauren Pree has been reported as missing by the West Frankfort Police Department and was last seen leaving her home in September. 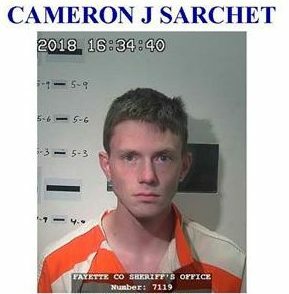 Also, Fayette County Crimestoppers is offering a $300 reward for information leading to the arrest of 21-year-old Cameron J. Sarchet. He is wanted on two warrants for escape and theft. All Secretary of State-run offices open weekdays will be closed Monday in observance of Veterans Day. Facilities generally open Tuesday through Saturday will be closed tomorrow. All offices and facilities will reopen on Tuesday under normal operating hours. The Secret Santa Tree will once again be located at Kincaid’s in Fairfield this year, and the Secret Santa Committee will decorate it tomorrow. They will also sponsor porkburger and bake sales from 10 a.m. to 2 p.m. tomorrow at Kincaid’s. The public is encouraged to support the cause at the sales, and also to help even more by taking a tag and helping to brighten someone’s Christmas. The monthly meeting of the National Active and Retired Federal Employees will be held on Tuesday at 11:30 a.m. at the Fairfield DiMaggio’s. All members and prospective members are encouraged to attend, and anyone seeking more information on the organization or meeting is asked to call 847-2321. Governor-elect JB Pritzker says voters elected him because of their trust in him to clean up the state’s government, end conflicts of interest, and reform campaign finance laws. Pritzker will be inaugurated in January, and he plans to spend his first legislative session working on a balanced budget, funded in part with tax revenue from legalizing recreational marijuana. Egyptian Health Department’s CEO Angie Hampton told the Wayne County Board yesterday that Egyptian will begin providing substance abuse counseling, along with adult, youth, and children’s mental health services, in Wayne County starting December 1st. The local office will consist of six employees, with four being hired locally. Egyptian’s office hours will be 8-5 on weekdays, with the office open until 8 on Tuesday nights. The Edwards County Board passed their budget yesterday, and the Dispatcher’s Budget line item, which had been a part of the Sheriff’s Department’s budget, was set apart as its own department. Edwards County officials said that, though the dispatchers are now standing alone in terms of their budget, it is not immediately clear what department will be placed in charge of dispatch. The boil order that was issued in the Village of West Salem for all residents east of Main Street and south of North Street has been lifted. Customers in those areas no longer have to boil water to be used for human consumption. Frontier Community College recently awarded four nursing students $500 scholarships. 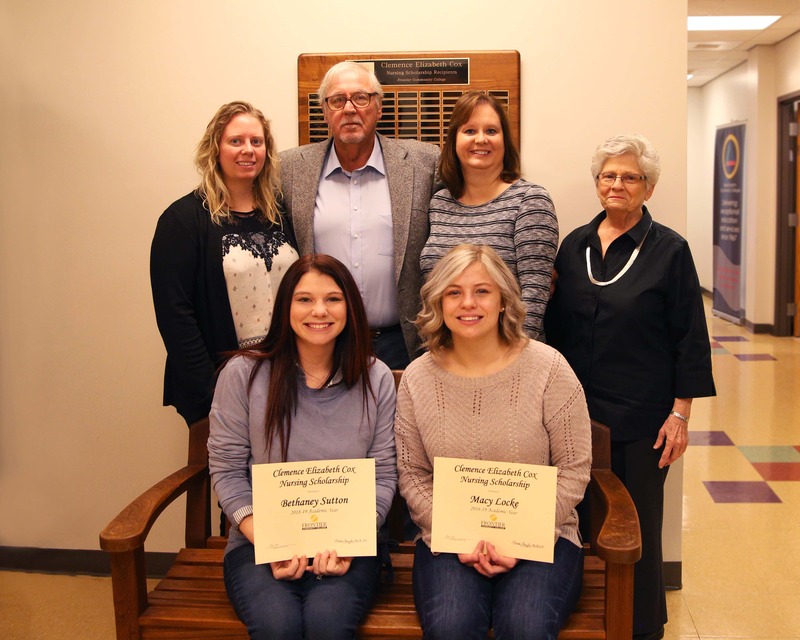 Bethaney Sutton and Macy Locke were recipients of the Clemence Elizabeth Cox Scholarship, and they are both on track to complete their Associate Degrees in Nursing in May. 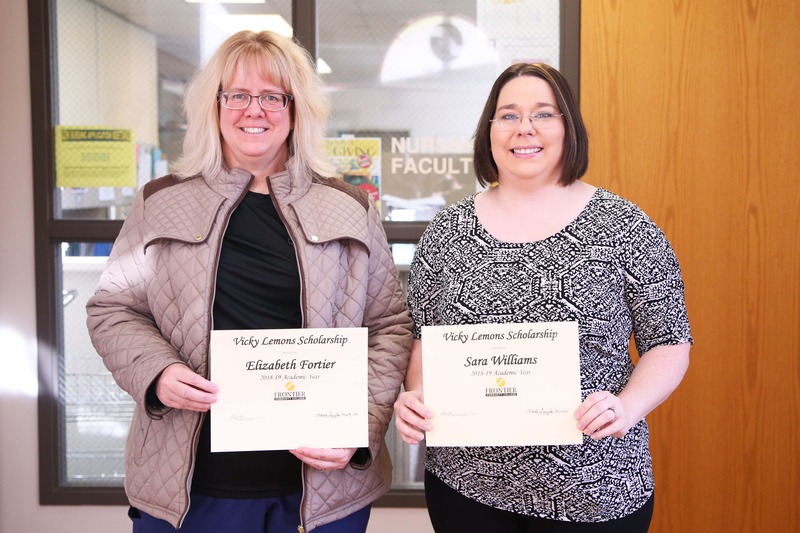 Elizabeth Fortier and Sara Williams were awarded the Vicky Lemons Memorial Scholarship. Pictured are, front row (L to R): students Bethaney Sutton and Macy Locke. Back row: Nursing Instructor Brittany Harris, donor Jerry Cox, Nursing Advisor Julie Bullard, and Nursing Instructor Wanda Douglas. Pictured are Elizabeth Fortier (left) and Sara Williams, recipients of the FCC Vicky Lemons Memorial Scholarship. Edwards County High School will conduct a “Meet the Teams” event tonight for its winter sports programs. As with the fall event, parents will have an opportunity to take photos and see some of the work done by students in advance of the season. The night will begin with photo opportunities at 5:15, and admission will be a non-perishable food item. The Fairfield Veterans Day Parade is set to begin at 2 tomorrow afternoon, and parade participants are asked to come to the lineup on First Street from the south. The parade will head down Main Street and end at the old Airtex Parking lot. At its conclusion, participants are invited to a meal provided by Fairfield National Bank and the Elks. The Illinois Department of Natural Resources says a limited number of Illinois firearm and muzzleloader deer permits are still available over-the-counter from DNR Direct license and permit vendors. Archery Deer and Archery Fall Turkey permits are also available, and hunters can apply for the first lottery for 2019 Spring Wild Turkey Season permits online at dnr.illnois.gov. River stages as of this morning: Little Wabash, east of Fairfield stands at 21.95 feet, above the 17 ft. flood stage. Meanwhile, the Skillet Fork at Wayne City has a reading of 6.27 feet (flood stage is 15 ft.). The Little Wabash below Clay City is at 14.07 feet (flood stage is 18 ft.).